KDG Cooks can handle events up to 200 guests or as small as only 2. We create custom menus with your tastes and preferences in mind. We can also tailor the menu to pair with any wines you choose, or we can recommend wines that will best complement the food. In addition to food and wine pairings, we can provide all tableware, staffing, bartenders and anything else you require to make your event a success. KDG Cooks is the exclusive chef and caterer for Nevada County Escapes and a preferred caterer of the Nevada City Miners Foundry. 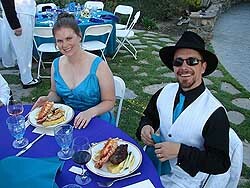 We are also a member of NCWeds – the official wedding planning website of Nevada County. Contact me to plan your event. Email: kady@kdgcooks.com or by phone at 530.798.3822.